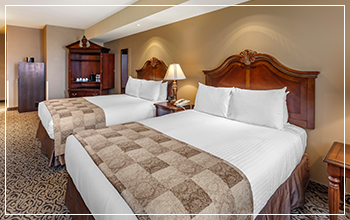 Share in the splendor of Stratford, Ontario with your loved ones by booking a 2-bedroom suite at The Parlour Inn. 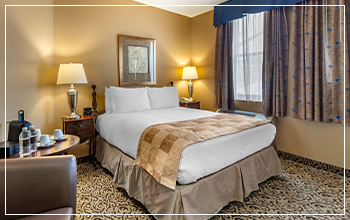 These exceptional & spacious suites offer over 450 square feet for relaxation and fun. The Parlour Inn suites are the perfect rooms for two couples or family & friends travelling together. 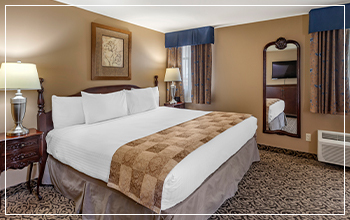 Enjoy an extended vacation without sacrificing the spaciousness and comfort of home. These 2-bedroom suites enable you to take pleasure in your guests while also having the private space to unpack, spread out and unwind. 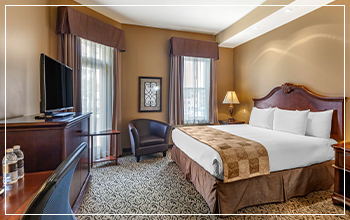 Stratford, Ontario is the perfect place for a family vacation or couples weekend. The town’s world-renowned theatre produces shows that are suitable for every age and taste. From romantic comedies to Shakespearean tragedies, you cannot miss the spectacular talent that will be present at this year’s Stratford Festival. While you are visiting, make the short walk to any one of the four theatres and then return to our hotel for a fun fine-dining atmosphere. Our Gastropub boasts delicious flavours, familiar menu items with exceptional twists, and international beverages for every party to sip and savour. Join us in the lounge or dining room, or take advantage of room service and relax in your suite. Each bedroom in the suite offers a Queen bed with its own ensuite bathroom. Couples will have their own space to get dolled up for a night on the town. Parents will have their peace and quiet in the bedroom and bathroom separate from their little ones. The comfortable living area is shared between the two bedrooms and includes a wet bar with mini fridge and microwave. This is perfect for saving your delicious leftovers from the onsite Gastropub or for preparing a picnic to take to Shakespeare Gardens. The living room also includes a pullout sofa and table for four. Both bedrooms and the living area are equipped with flatscreen televisions. That way, everyone has a cozy place to sleep, visit and play. 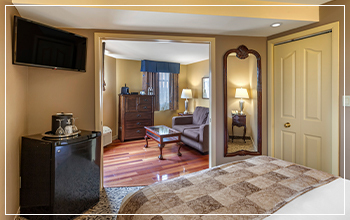 Our 2-bedroom Suite offers the ultimate retreat with every convenience. You will fall in love with the atmosphere, flavours, and luxurious accommodation that The Parlour Inn has to offer that you will never want to leave! Book your upscale getaway now or call to reserve a Suite with our friendly concierge.